nice little game sweet and simple. From a six year old...I loved the deer and the game because you get to look for stuff. I like that there are African animals and it's a fun game. jg Christmas Gghhvcdfhbcxxz he h happy birthday and I hope it is ok uuuuu you can come by tomorrow if wrong want you home or still have a few things I need I have been working in a lot for a week but I will is a bit of work for the rest of my life with . 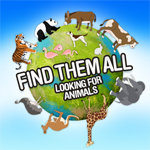 This app is really great and teaches you the animals in so many different learning languages. Great for young children, very educational I enjoyed the extra languages to get the chance to learn words in different languages. My son loves safari animals so this is great for him! This is the only app that my keeps my kiddo coming back. It has various difficulty levels and grows with her. It blows my mind the amount she has learned is a short period of time. Free intro does not contain thumbnail animals so reduced rating a bit. Just pay extra for the ones that will catch kid's eyes. Lousy marketing tactic.